It looks like smooth sailing for renewing the Patriot Act. Legislation to renew the anti-terror measure was cleared for final congressional passage when the speaker of the House of Representatives blessed a day-old compromise between the White House and Senate Republicans. The legislation accepted Friday by Speaker Dennis Hastert would expand the powers of federal agents in investigations of suspected terrorists in the United States. That, President George W. Bush's administration says, is one of the key weapons in the fight against terror. 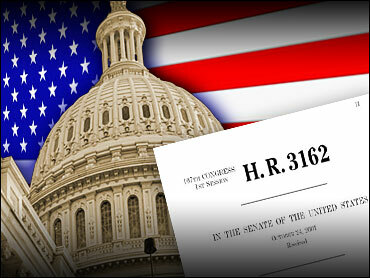 Senate Democratic leader Harry Reid also indicated he will vote for the bill. Voting on the bill could be scheduled as early as next week. "I think (changes in the bill) were enough to make sure we can protect the American people," Hastert told reporters on an out-of-Washington trip. The changes are three revisions that the white House and Senate Republican holdouts announced Thursday. The House "should move forward with it as soon as the Senate" acts, he said. A short-term extension of the measure expires March 10. Passage of the bill was stalled late last year when four Senate Republicans joined Democrats in saying it shortchanged civil liberties protections in the name of fighting terror. Reid's spokesman, Jim Manley, said the top Democrat intends to vote for the bill. The Senate's second-ranking Democrat, Sen. Richard Durbin, also is among its supporters. Changes made still would have to be approved by the House, but Republican Sen. Larry Craig, a negotiator on the bill, said that with the Senate and the presidential staff in concert, he thought the House would go along. He said he had consulted with House Judiciary Committee Chairman James Sensenbrenner. Sensenbrenner, whose committee must deal with the bill before it goes for a vote, would not comment. Hastert said he had discussed the bill with the chairman. Under the first, recipients of court-approved subpoenas for information in terrorist investigations would have the right to challenge a requirement that they refrain from telling anyone. The second removes a requirement that an individual provide the FBI with the name of an attorney consulted about a National Security Letter, which is a demand for records issued by administrators. The third clarifies that most libraries are not subject to National Security Letter demands for information about suspected terrorists. White House spokesman Scott McClellan said the agreement would "continue to build upon the civil liberties protections that are in place but do so in a way that doesn't compromise our national security priorities." Democratic Sen. Russell Feingold, a leader in opposing the act, said he would continue to fight it. He said the deal did not provide meaningful judicial review of gag orders because such a review can take place only after a year has passed and can be successful only if the recipient proves the government acted in bad faith. The law originally was passed within days of the attacks of Sept. 11, 2001, and the administration says it has been an important weapon in the government's arsenal for tracking suspected terrorists. Renewal of the law was blocked last year when critics said its provisions shortchanged civil liberties, particularly in the cases of individuals who were not suspected of terrorist activities themselves, but might have had innocent dealings with suspects.